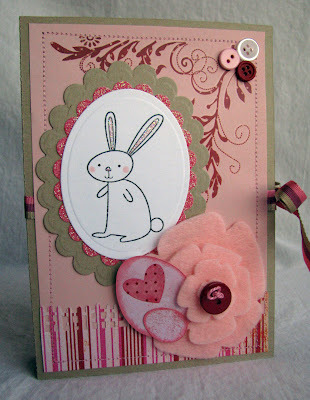 Scrappin' with DeeDee: A Game and A Challenge - FUN Stuff! A Game and A Challenge - FUN Stuff! 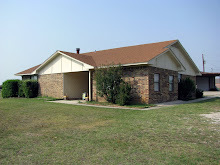 My sweet friend Jess tagged me to play a blog photo sharing game. The rules of this game are: go to your picture file and blog about the 4th picture in there, then tag 4 other bloggers to do the same. Well, I have LOTS of folders with LOTS of pictures in them...mostly my cards, which you've already seen once and probably don't want to see again.....so, I chose my random folder and took the 4th picture in there. This is my sweet girl kitty Lucy! She so very shy and only loves her Mama.....I used to use this old silk dress to photograph my cards on and she ran and jumped in the chair while Mama had her back turned for a moment. Of course, I had to snap her picture! Isn't she the sweetest girl! Now I tag Lillie, Donna, Peet and Kim....a few of my fellow design team members on The Cutting Cafe' crew. Have fun girlies! Now, on to my project for today! I made a greeting card folder. The template is from The Cutting Cafe' and oh my goodness it was so much fun to put together! I used my Pazzles machine to cut it out. 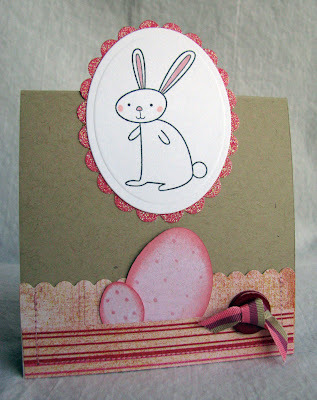 Here's my card, simple but has all the requirements for a chance to win the cute little apron! 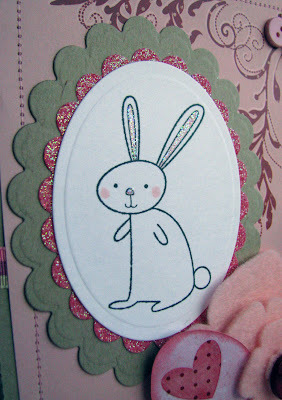 The cute bunny is a Stampin' Up stamp I got a few years back. I'm in the Easter mode right now, so I knew I was going to make an Easter something! LOL! 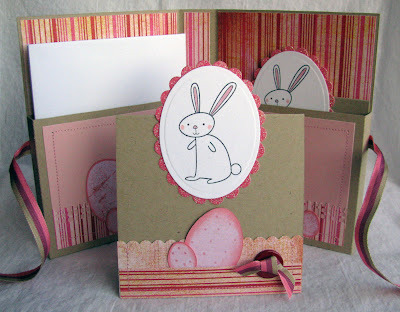 I made 3 cards to go inside the sweet little greeting card folder. 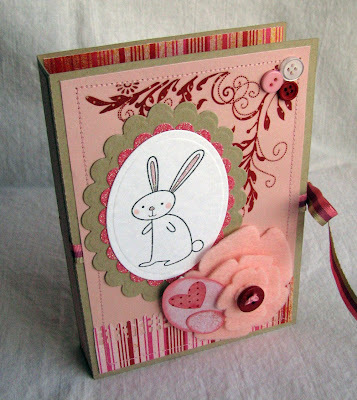 The base of the folder and the cards are Kraft card stock....love that stuff! The striped paper is Basic Grey. Guess what? This set is for sale in my Etsy shop! Here's what it looks like with all the cards and envys tucked away. The eggs were cut using my Cricut Doodlecharms cartridge. Oh and that very pretty perfectly matching ribbon I used to tie it all up with.....my sweet friend TeriBeri sent that to me....THANK YOU Teri! Wow! This is a fabulous set. I love everything about it. Your kitty is adorable!! And so is your card set -- good luck gunning for that apron! If I were the judge, you'd already be the winner! 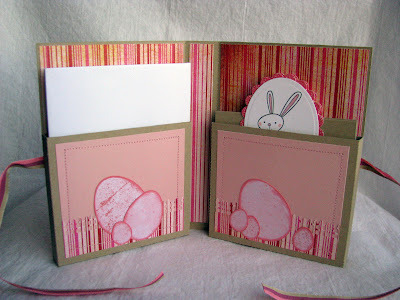 Love it, love it DeeDee...what a sweet idea and adorable creation! this card folder with cards is fantastic DeeDee!!! Love that bunny and the paper is so yummy!!! Great set and best of luck winning the apron! how cute is your little set!!! i love that folder! SO CUTE!!!!! Wow, what an amazing creation! What a sweet, sweet idea! Great job!